Though writer/director Colin Minihan and Stuart Ortiz made a big splash a couple of years ago with the release of Grave Encounters (review) under the moniker of "The Vicious Brothers," the pair have slowly drifted into separate careers with What Keeps You Alive marking Minihan's first solo effort as both writer and director. Minihan's latest has been much buzzed about since it premiered at SXSW earlier this year. It stars Hannah Emily Anderson and Brittany Allen as Jackie and Jules respectively, a couple who take a vacation to a remote cabin to celebrate their one year anniversary. Shortly after the pair arrive, Jackie starts to display a dark streak and when she shares a story about her ex-wife, it quickly becomes clear that she's not always the sweet loving person Jules thinks her to be. I'm loving this trailer which suggests this vacation goes sideways in a very bad way fairly quickly and though the plot sounded fairly uninteresting, I'm really impressed by the trailer which features a couple of really memorable moments. 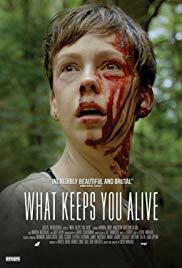 What Keeps You Alive opens in theatres and will be available on VOD August 24.